Two northeastern states I haven't roadgeeked in are VT and NH. Any state-named shields left? Non-reflective button copy etc? embossed signs? Or other cool things still around? Both still have scattered button copy and state-name shields, especially off-Interstate. Most, if not all, of Vermont's remaining button-copy is gone now. There MIGHT be lingering signs in Newport or White River Jct, but that'd be it. Fair Haven used to have a couple, but one is gone and the other no longer has the buttons. A number of state-name I-91 shields still exist, including on the mainline (mostly southbound mainline). Embossed signs are rare, but can be found on some town roads. 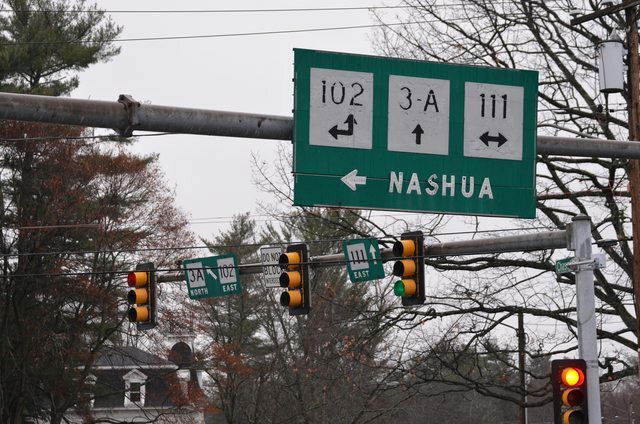 The latest sign replacement project got rid of all state name interstate shields on I-91 between the MA border and Exit 6. Though you may see a few between Exits 7 & 9. Newport is a cool little town/city, right on a big international lake and in the Northeast Kingdom, an area that certainly "pops" in the next couple weeks as far as foliage goes. Plus it'll basically "clinch" I-91 for ya, drive up the extra 5 miles to Derby Line at the border, and turn around. You got it. From Newport, it's a nice drive across the rooftop to the I-91 corridor. VT 105 all the way. Now as far as old state highway signage on the backroads, your best choices for that are the roads that are assigned a route number but are maintained by the towns they pass through, not the state. Confusing I know. I'm talking about VT 121 from Rockingham (Bellows Falls), west, and VT 140 from Wallingford, east, and VT 132 from Sharon (I-89 Exit 2), north. It's been a while since I've travelled these, but in the past, some gems were to be found, such as old embossed signs, opposite side of road-mounted square state route markers, etc. If anything, there's an odd VT 121 shield in Westminster, plus some NH shields in VT as well. Used to be some VT-modified-NH shields in Bellows Falls along US 5, plus some state-named I-shields, but I think they're mostly gone. And then there's the odd-duck signage at I-91 Exit 2 in Brattleboro, which combines an I-91 shield with all-text US 5 and VT 9 wording. But it's scheduled for replacement, so its on borrowed time. If its interesting road sights to see, head to Burlington and get off I-89 at Exit 13, onto I-189. It ends at a partially abandoned freeway, with the road to the west closed off. Or get off at I-89 Exit 4, west on VT 66 to VT 12 North and take that to VT 65 West, a dirt-road state maintained highway, which crosses over a floating bridge (which just reopened this year) to Brookfield. Down in Bennington is the oddly configured systems interchange between US 7 and VT 279, a bypass east and west of US 7. US 7 continues as a Super 2 for about 20-30 miles north. Can't think of any real button copy, or any old signage for that matter. The oldest was on I-93 south of Manchester and that's all getting replaced, if it hasn't already, as part of the project to widen it from 4 to 8 lanes. What was left of old signage further up in the Lincoln area is gone now. And by old I mean it had the white outline "old man" state route shield, vs the cutout now on signs. The small toll booths on the Spaulding Tpke in Dover and Rochester are kinda cool. 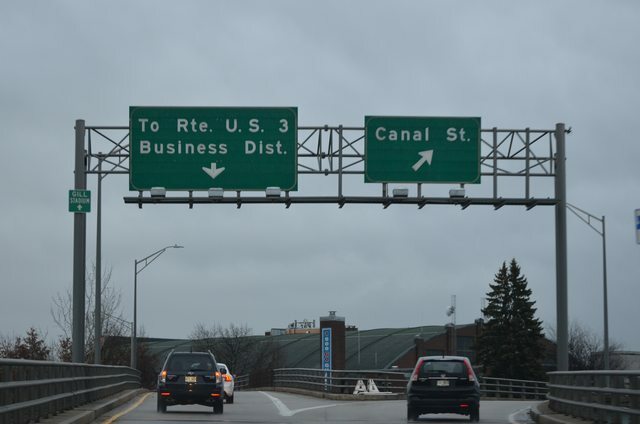 Rochester used to have button copy signage, including square shields (predating the "old man" shields"), but they got wiped out when the turnpike went from a "super 2" to a full blown 4-lane turnpike. Take a spin up NH 16 to the White Mtns and either go through Crawford Notch and come down I-93 (or head north on I-93 to St Johnsbury VT), or from Conway cross the mtns on NH 112, the Kancamagus Highway. Either take that right to I-93 or stay on to Woodsville NH and you're at US 302 and can head up I-91 thataway. Old signage is tough to come by, but its worth the trip up to the area, if anything for the scenic beauty. Gone as of October 2014. Only shields are posted for VT 191 on US 5/VT 105 now. There are still at least two southbound further north, one of them just past I-89. Are the ancient shields on VT 35 still up? I used some roadgeeking websites and they were still up, and there's some ancient signs on VT 121. I don't know if that area hasn't been touched by sign replacement. That's one of the areas shadyjay was referring to...in Grafton. It's been a number of years since I was last through Grafton, so I'm not sure if the old 35/121 shields are still there. I then continued on GSVing VT 121 rather than 35 to see if there's any there. Here's one, at Th...OUGHTO VILLE RD. This one is not far from Grafton. I'll skip a bit ahead. I give up here, there was nothing between Grafton and Chester. I-91 onramp signage at Exit 2 in Brattleboro remains the old overheads, observed 9/25. 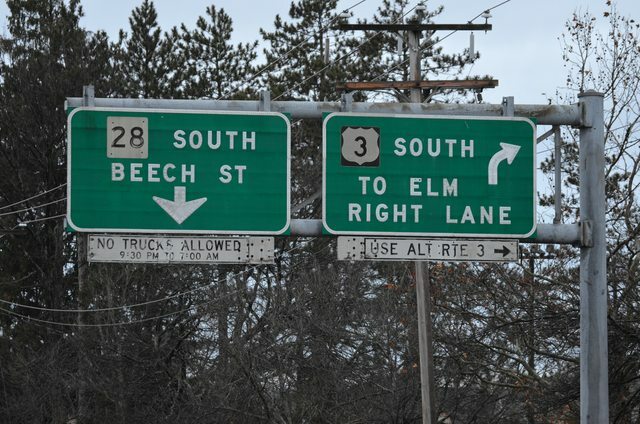 I'd get them sooner than later, if desired, cause it appears most mainline signage has been replaced in the area... except the final SB sign for Exit 3 and regulatory signs between Exit 3 and 2. There is an older state name I-91 shield in that mix. Guess they're waiting for the West River Bridge project to be finished. There's no room for construction crews to get in and replace signs in that area since all traffic is using the SB roadway. Other mainline I-91 old state name shields still exist at these locations: NB after Exit 7, NB after Exit 8, SB after Exit 10, SB after Exit 8, SB after Exit 7. NB/SB at Exit 9 were replaced under a spot project which replaced the BGSs for Exit 9 as well a few years back. 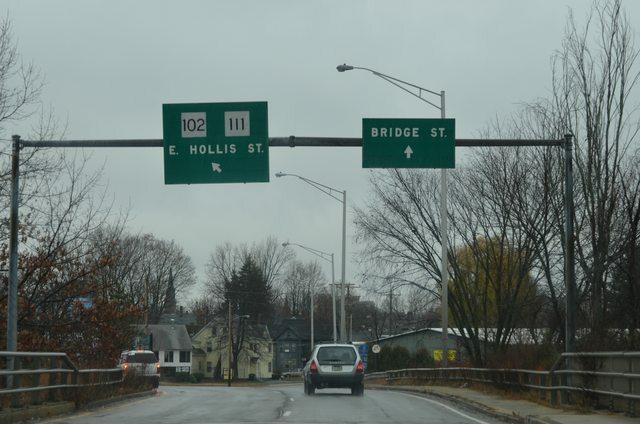 Older style signage is left on the mainline for Exit 7 (all old shields - no green VT shields), Exit 8 (original sign modified with new green shields), and Exit 10 (all signs NB, only exit signs SB). All other I-91 mainline shields replaced, all neutered, and with the "EIS" shield. No state name shields left on I-89 mainline. In Bennington, well, Shaftsbury, there is a NRBC sign remaining along the access ramp at Exit 2 of US 7, but approaching US 7 from Historic VT 7A. Route 121 has quite a variety of old/odd shields. Starting at US 5 in Bellows Falls are a couple of unique ovals for 121 with green borders (rather than black), but with black numerals. You will find both varieties of ovals between BF and Grafton (rounded, flattened... rounded is the state standard these days). Once west of Grafton, there are a few old squares (with the thick border) and old 3ds circles. Still a couple of very old tiny squares with the state name west of Grafton as well. There used to be a pair of 35/121 tiny squares on the concurrency in Grafton, but they have disappeared in the last few years. And in Windham, eastbound travelers are treated to an erroneous US 121 shield at the Windham Hill Road intersection. These have been replaced with new circle/oval shields. 121 has an incorrect "NORTH" banner. TH1 HOUGHTONVILLE RD. The reverse-color old square still stands. There used to be a few old tiny state name 35 shields between Cambridgeport and Townshend, but they are gone. There is an old 35 square SB in Athens that has turned completely black. There really is nothing between Grafton and Chester (pretty ride, though). As far as New Hampshire goes, there aren't too many state-named interstate shields left save for some city installed ones around Manchester (with some... *cough*... beautiful... series F numerals). I'm not sure if these are still there since the most recent GSV is from 2011 for both of these, but Concord has (had?) 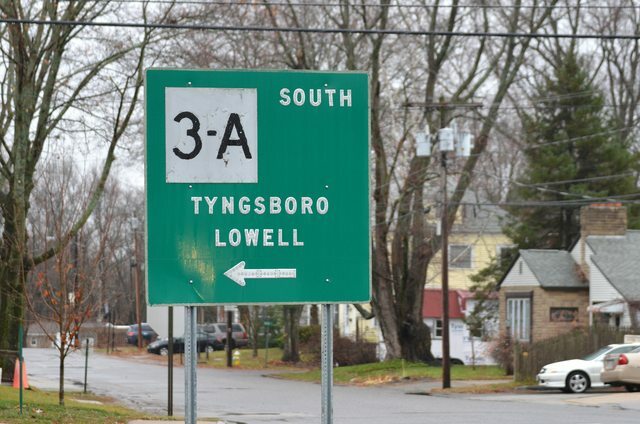 a state-named I-89 shield at the intersection of NH 13 (Clinton Street) and Fruit Street as well as a state-named I-93 shield at the intersection of Main Street/Centre Street/Loudon Road in the center of town. That's pretty much it in terms of state-named interstate shields in New Hampshire. As far as button copy in NH is concerned, all of it is gone from the interstates and turnpikes, but there's some scattered around random state routes that travel through cities. All of the photos below were taken late November of last year, so I wouldn't be surprised if they're still there. These first two are along NH 3A in Hudson, where it turns from Central to Chase Street. And just two blocks beyond the above intersection, where NH 3A meets NH 102 and 111, are these signs. The sign in the foreground as well as the ones mounted on the traffic signal arm in the background are all button copy. Not a button copy sign, but it's a shield that may be worth checking out. 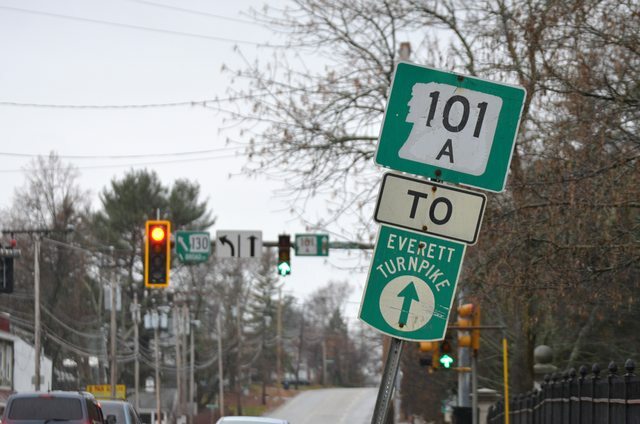 Old stand-alone Everett Turnpike shield along Amherst Street (NH 101A) at Broad Street (NH 130) in Nashua. 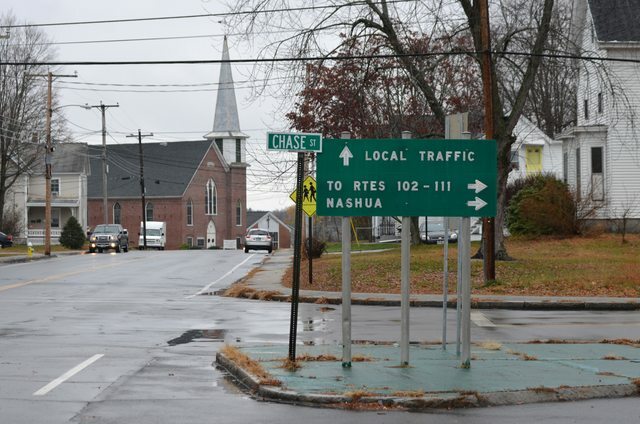 And lastly, also in Manchester are these button copy signs along US 3/NH 28 (Hooksett Road) at the south end of their duplex where it meets the 5-way intersection between Beech and Webster Streets. I lived in New England from June 2000 to February 2008, mostly in Massachusetts, but from May 2001 to August 2002 I lived in Nashua, NH. In my entire time living up that way, I think I saw ONE state-named NH I-93 shield somewhere around Concord. Probably gone by now. You may be interested to know that the signage for Exit 4 off US-3 used to say "FAA Center" for the Boston ARTCC (I have been there, as I used to write software for domestic air traffic control). That came down off the sign VERY shortly after 9/11. now it just says E Dunstable Road with a blank space underneath. Ive been in Nashua many many times as one of my close friends lives there and I visit him often.